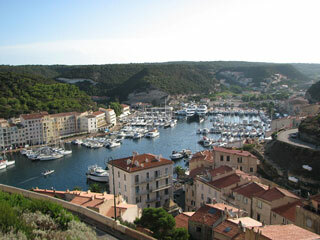 Bonifacio is located directly on the Mediterranean Sea, separated from Sardinia by the Strait of Bonifacio. It is a city placed on the best and only major harbour of the southern coast and also is a commune covering a somewhat larger region including the offshore Isles Lavezzi, giving it the distinction of being the southernmost commune in Metropolitan France. This article uses material from the Wikipedia article "Bonifacio, Corse-du-Sud", which is released under the Creative Commons Attribution-Share-Alike 3.0 License.